The Livery has a continuing role in commerce and trade. 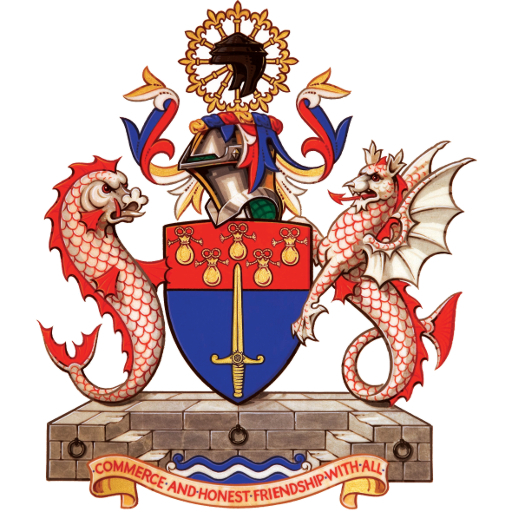 Here are some examples of how Livery Companies continue to support trade. Since 1300, The Goldsmiths’ Company has been responsible for assaying (testing for purity) and marking gold and silver wares. From 1478 these wares were required to be brought to its hall for testing, the origin of the word ‘hallmark’. Today the Goldsmiths continue to run the London Assay Office where several million articles of gold, silver and platinum are hallmarked each year. The Blacksmiths award a range of Certificates, Diplomas and Medals to recognise smiths who have attained various defined levels of competence and quality of workmanship. They also give prizes for competitions at county shows held throughout the country, and administer a trade mark scheme. The Fishmongers continue an ancient market quality control in ensuring that the fish sold daily in Billingsgate Market for tables throughout the UK is fit for human consumption. The company has powers of inspection and seizure through its Fishmeters, the inspectors who have been carrying out these duties since 1604. The Vintners’ Company has in more recent years been responsible for ensuring that EU wine legislation regulations are implemented through its Wine Standards Board. The Gunmakers’ Company is responsible for ensuring that guns sold in the United Kingdom are safe to fire. Guns are proofed by firing a charge 30% greater than normal. Guns from overseas are treated the same way unless they originate from countries with which there is a reciprocal proofing agreement. By law, horses must be shod by skilled and registered persons. The Farriers’ Company has a legal duty to secure the required standards for the trade and to examine those wishing to qualify for its diploma entitling them to the necessary registration. The Saddlers’ Company has many working saddlers among its membership and substantially underwrites the Society of Master Saddlers. The Company funds its Millennium Apprenticeship Scheme, has introduced the Modern Apprenticeship Scheme for saddlery, maintains the National Register of Qualified Saddlers and hosts the National SMS Saddlery and Harness Competition annually. The Pewterers’ Company renewed its connection with the craft in 1970, since when it has worked to improve the quality of pewter wares, support education, train pewtersmiths and act as a custodian of the history if the trade. As the agent for the Port of London, the Company of Watermen & Lightermen is responsible for examining and licensing anyone who wants to work as a waterman or lighterman on the tidal River Thames. The Scriveners’ Company has maintained its connection with the original craft of writing legal documents. It examines, qualifies and regulates full time members of the profession of Notaries Public in the City who are known as Scrivener Notaries. Optical technicians are trained and examined in the most modern aspects of their industry through the role of the Spectacle Makers’ Company. With the above as just a few examples, it is perhaps surprising how many contemporary trades still enjoy their ancient guild connections. You can read more about the work of the World Traders in supporting commerce here.